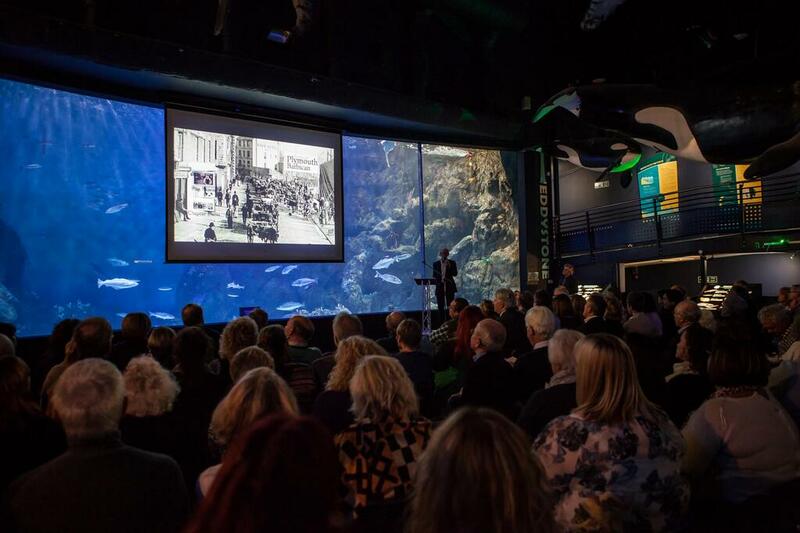 The spectacular Eddystone Reef tank made a stunning – and appropriate – backdrop for the launch of the new DVD ‘The Story of the Barbican’ this week. The evening was introduced by Dr David Gibson, the Director of the National Marine Aquarium who said he was delighted to be hosting the event and he was followed by the film-maker Alan Tibbitts, who has recently relocated from Exminster to the Barbican. However it is not the first film about Plymouth that he has been involved with, as, over the last 20 years, he and his friend and colleague Chris Robinson have now made ten full-length features on varying aspects of the City – many of which have been based around Chris’s books. Chris first opened his Barbican studio workshop 35 years ago this very week and has written over 20 books on Plymouth, including the Historic Barbican. The Story of Plymouth Barbican traces the history of the area over the last 1,000 years, from a small ‘inhabitation of fishers’ through a booming Tudor town and then a crowded commercial harbour, to a bustling tourist destination, populated by pubs, restaurants, independent shops and artist’s studios. The film plots this heady transformation and, through the use of extensive archive material and contemporary footage, clearly demonstrates how much of the Barbican survived the war … but not the post-war planning. Featuring the Elizabethan House and Gardens, the Merchant’s House, Plymouth Gin, the National Marine Aquarium and much much more, the Story of Plymouth Barbican also includes a very rare – and a very candid – interview with Robert Lenkiewicz.